COMPAR-EU is a multimethod, interdisciplinary project that will contribute to bridging the gap between current knowledge and practice of self-management interventions. COMPAR-EU aims to identify, compare, and rank the most effective and cost-effective self-management interventions (SMIs) for adults in Europe living with one of the four high-priority chronic conditions: type 2 diabetes, obesity, chronic obstructive pulmonary disease, and heart failure. 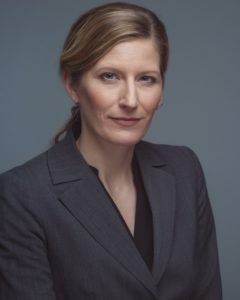 The project will provide support for policymakers, guideline developers and professionals to make informed decisions on the adoption of the most suitable self-management interventions through an IT platform, featuring decision-making tools adapted to the needs of a wide range of end users (including researchers, patients, and industry). The project applies network meta-analysis, an extension of traditional meta-analysis, which allows multiple (rather than pairwise) comparisons of intervention effectiveness. The work is based on a validated taxonomy of SMIs and prioritises outcomes from the patient´s perspective. The cost-effectiveness of the most effective SMIs is estimated and contextual factors associated with the SMI implementation are analysed. Based on the analyses, COMPAR-EU develops and pilots decision-making tools to facilitate and disseminate the most effective self-management interventions to key target end users. 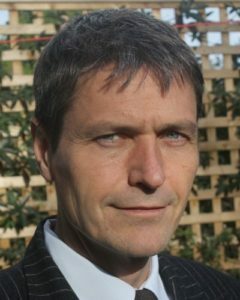 A multiprong strategy for exploitation of the research findings is developed, leading to clear business cases for SMI implementation in different contexts within the heterogeneous EU health system. The research project addresses the need to provide additional evidence in a field that is crucially important for the management of chronic conditions. At the same time, all our efforts are focused on the practical implementation of the research evidence, supporting SMEs and other commercial partners as well as governments, clinicians and managers in the diffusion of the innovations generated by this project. Moreover, it promotes EU competitiveness in a globally emerging market. Because of the high public health relevance in terms of burden, frequency and socio-economic impact, the four chronic conditions type 2 diabetes, obesity, COPD, and heart failure are studied in COMPAR-EU. NMA is an extension of pairwise meta-analysis that aggregates results from multiple studies. NMA compares, within a unified framework, multiple interventions and synthesises both sources of evidence, direct and indirect. Thereby, NMA provides more precise estimates of effectiveness, even for interventions that have not been compared in the same trial. NMA provides two main findings for each outcome analysed: the relative effect for all pairwise comparisons and a ranking of interventions. The fundamental assumption of NMA is transitivity. It implies that the distribution of effect modifiers is the same across treatment comparisons. Analyses are stratified to assess whether the effectiveness of a particular intervention varies by gender, socio-economic status, health literacy, population group, or comorbidity. For more information about our approach in COMPAR-EU, see also work package 5. Self-management interventions can only be beneficial to society if benefits outweigh costs. CEA can inform policymakers at which price self-management is beneficial to a society, a health care budget, or a patient. Cost-effectiveness modelling will be conducted for the most effective interventions (identified by NMA). The core of a cost-effectiveness study is the development of a conceptual model that describes the course of the condition and identifies the relevant outcomes that should be affected by a SMI. The impact of self-management on these outcomes will be crucial for estimating its impact on quality and length of life. CEA calculates a societal incremental cost-effectiveness ratio, expressed as cost per quality adjusted life years (QALY). QALY is a summary measure that incorporates the impact on both the quantity and quality of life. CEA includes cost parameters such as health care use, costs in life years gained, productivity losses, and caregiver burden. For more information about our approach in COMPAR-EU, see also work package 6. COMPAR-EU aims to identify, compare, and rank the most effective and cost-effective self-management interventions (including preventive and management domains) in Europe for adults suffering from one of the four high-priority chronic diseases: type 2 diabetes, obesity, chronic obstructive pulmonary disease (COPD), and heart failure. Ultimately, COMPAR-EU facilitates shared decision-making and supports implementation of best practices in different health care contexts through an interactive platform, featuring decision-making tools and other end products adapted to the needs of expected end users (member state policymakers, guideline developers and researchers, health care professionals, patients, and industry). Specific objective 1: As SMIs are frequently complex, multifaceted interventions, the use of taxonomies is necessary to classify critical attributes of SMIs. Our first objective is to validate a self-management taxonomy to inform the research steps that follow, ensuring both homogeneity and comparability. Specific objective 2: Our second objective is to identify and prioritise SMI outcomes from patients´ perspectives using systematic literature review and Delphi survey with patient and carer representatives to ensure that the included outcomes truly reflect patients´ priorities and preferences. 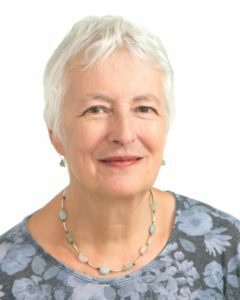 Specific objective 3: Our third objective is to synthesise existing evidence of SMIs and outcomes to provide information on the type and numbers of interventions, outcome results, patient characteristics, self-management components, and comorbidity profiles for each of the studied conditions. Specific objective 4: Our fourth objective is to compare SMIs through systematic review and network meta-analysis (NMA) and to calculate the relative treatment effect in order to rank SMIs for each outcome. NMA is a widely used approach for comparing multiple interventions. It statistically combines direct and indirect evidence from RCTs in a single analysis. Specific objective 5: Our fifth objective is to model the cost-effectiveness of SMIs from a societal, health care, and patient perspective. Cost-effectiveness analyses can inform decision makers at which price a SMI is beneficial to a society, a health care budget, or a patient. Specific objective 6: Our sixth objective is to analyse contextual and implementation factors of best performing SMIs with the aim to improve the implementability of SMIs. A contextual framework should explain how SMIs work in specific contexts and for specific patient groups and describes the most influencing factors for a successful implementation. Specific objective 7: The process from innovation to clinical practice is complex. Our seventh objective is to develop and pilot decision-making tools to facilitate and disseminate the use of the most effective SMIs to key target end users through the COMPAR-EU technology information platform. Specific objective 8: Our eighth and last objective is to conduct a comprehensive dissemination, communication, and exploitation plan adjusted to the different stakeholder groups to maximise the impact of the COMPAR-EU project. COMPAR-EU is based on a multimethod, interdisciplinary approach. The project is split into three main phases and is divided into ten work packages (WP), integrating partners from Belgium, Germany, Greece, the Netherlands and Spain. Previous standardisation activities are key to a proper synthesis of the existing literature and further comparison of SMIs as they ensure internal and external validity based on quality criteria. This phase of the project includes all relevant methods needed to prepare further work. Active involvement of service users in research can lead to research of greater quality and relevance owing to the unique perspective that users can bring to a research project. In COMPAR-EU, patient involvement has been built into the research design from an early stage and is integrated in an iterative fashion. This process is monitored by the European Patients’ Forum. This is a key stage of the project in which we identify existing RCTs of SMIs, extract key information for further evaluation, and establish methods to ensure the quality of the data and to summarise the information of SMIs and SMI outcomes. In this phase of the project, we compare interventions using NMA, which is a sophisticated method for statistically combining direct and indirect evidence from RCTs in a single analysis. Additional cost-effectiveness modelling is conducted for the most effective interventions, and contextual factors are analysed in order to better inform about implementation issues. Many problems facing health care systems today are due not to a lack of knowledge but rather to gaps between what we know and what we do. 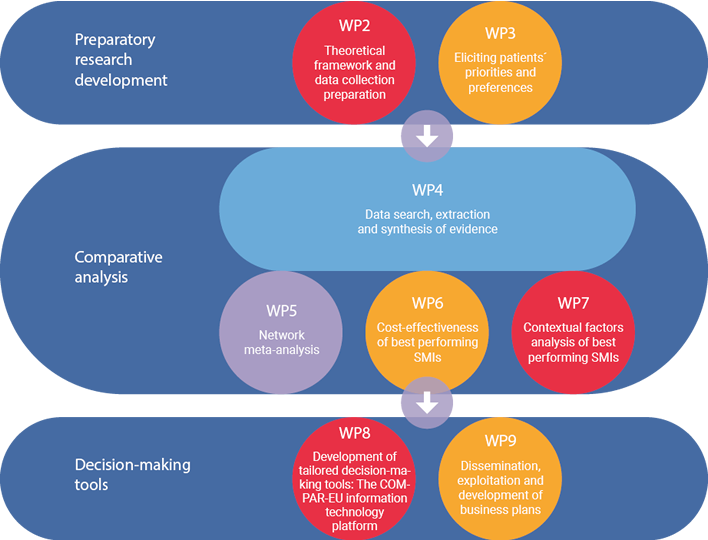 The process from innovation to clinical practice is complex but it could be facilitated by summarising and tailoring existing evidence to different end users and producing tools focused on easier, better-informed decision-making. This phase focuses on the development of a technological platform where tried-and-tested tools are used to integrate the information and evidence synthesised during the different phases of COMPAR-EU to facilitate decision-making for the target end users (patients, health care professionals, policymakers, researchers, and SMEs). The tools incorporate the new knowledge produced, mainly from the network meta-analysis and cost-effectiveness analysis. Substantial efforts are spent on the implementation of innovative activities to increase the impact of the research findings. This includes research activities and activities directly targeting the exploitation of the proposed decision-making tools. 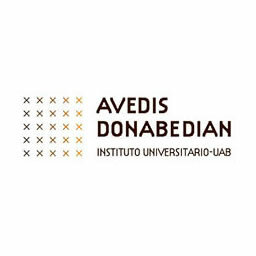 The Avedis Donabedian Research Institute (FAD) is a multidisciplinary Research Institute on Quality & Safety in Health and Social Care of the Universitat Autònoma de Barcelona (UAB). FAD develops research on health care quality since 1989. The main research areas are patient-centred care, quality improvement, patient safety and implementation research. The network of the institute includes professionals among health services professionals, researchers, physicians, nurses, psychologists, social educators, statisticians, etc. FAD has participated in recent research projects in the area of self-management in Europe (PRO-STEP, PISCE, EMPATHiE) and has extensive experience in implementing and scaling-up projects in organisations, with a continues effort to improve the systems of planning, managing and evaluating quality and safety in Health and Social Care environments, in Spain and internationally. FAD is leading the COMPAR-EU project and is responsible for the overall project management and scientific coordination. This includes full project administration support, as well as all matters regarding mandatory fulfilment of the European Commission requirements, project monitoring, plus quality control and overall communication. FAD also leads Work Package 2: Theoretical framework and data collection preparation. 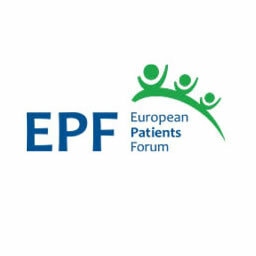 Founded in 2003, the European Patients’ Forum (EPF) is an umbrella organisation that works with patients’ groups in public health and health advocacy across Europe. EPF members represent specific chronic disease groups at EU level or are national coalitions of patients. EPF´s vision is that all patients with chronic and/or lifelong conditions in the EU have access to high quality, patient-centred equitable health and social care. EPF´s mission is to ensure that the patients’ community drives policies and programmes that affect patients’ lives to bring changes empowering them to be equal citizens in the EU. EPF helps to empower patients’ organisations through educational seminars, policy initiatives and projects. EPF coordinates Best Practice exchanges between patient organisations at European and national levels. The programmes also help to strengthen their organisational and advocacy capacity. In the COMPAR-EU project, EPF is responsible for identifying patients´ preferences through a modified Delphi consensus process, followed by a final workshop and for integrating patients´ priorities into the overall project. EPF monitors that patients´ views, gender and socio-economic dimensions are considered throughout the whole project. 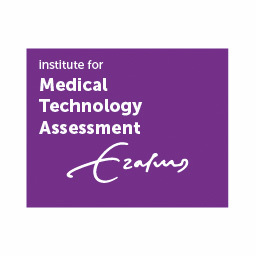 The Institute for Medical Technology Assessment (iMTA) is based at Erasmus University of Rotterdam, The Netherlands. 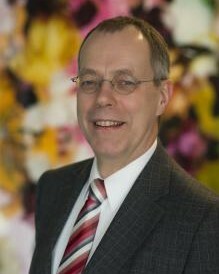 Since its foundation in 1988, iMTA has played a key role in HTA (Health Technology Assessment) research in the Netherlands, in Europe and worldwide. 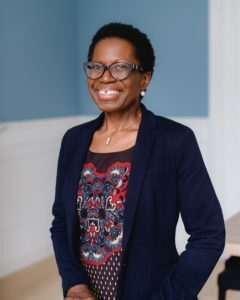 iMTA offers expertise in economic evaluation, cost analysis, and outcomes research and is dedicated to the use of cost-effectiveness information in health care decision-making. Its staff consists of about 40 scientists from different disciplines, including economics, econometrics, medicine, psychology, epidemiology, mathematics and pharmacy. iMTA was at the forefront of developments in the societal perspective for economic evaluation in health, including the development of the friction cost-method for productivity losses, the development of the cost-effectiveness acceptability curves, measurement of presenteeism, development of questionnaires for productivity losses, measurement of caregiver costs and burden, including specifically developed questionnaires to measure these items (the iMTA valuation of informal care questionnaire, including the CarerQoL) and the valuation of the EQ-5D-5L. In the COMPAR-EU project, iMTA is responsible for the cost-effectiveness evaluation of the most effective self-management interventions identified. The Netherlands Institute for Health Services Research (Nivel) is an independent research institute, legally a not-for-profit organisation. Nivel’s mission is the execution of high-quality research with demonstrable societal impact. 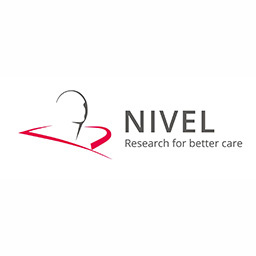 For already 30 years, Nivel researchers gather, analyse and synthesise data and information to gain knowledge and insights about the quality and effectiveness of health care delivery and related social services in the Netherlands, and partly in Europe. Currently, its research domain covers the entire health care system. Nivel´s staff consists of approximately 100 researchers in health services research and allied areas. Since 1987, Nivel is also a WHO Collaborating Centre for Primary Health Care. 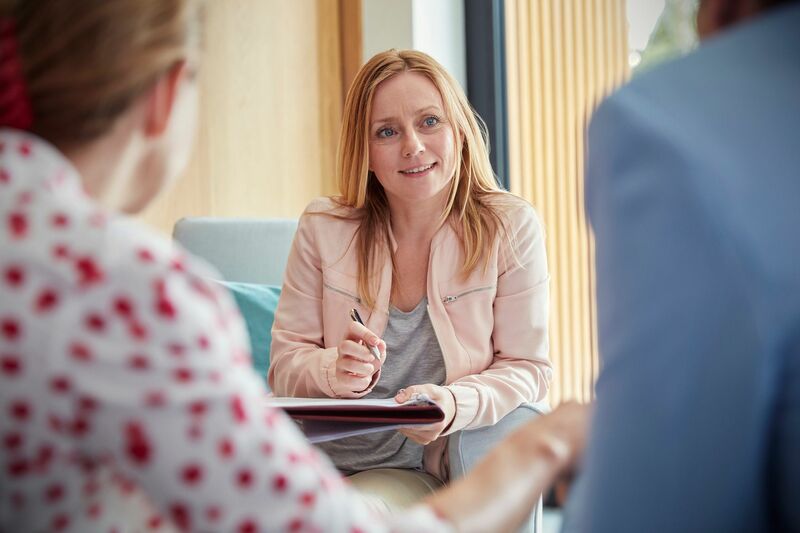 In the COMPAR-EU project, Nivel is responsible for data collection and the analysis of contextual factors to determine characteristics of successful application of most effective self-management interventions for specific patient groups. Nivel also contributes to validate the self-management taxonomy and the core outcome measures scanning. The Iberoamerican Cochrane Centre (CCIb) is a non-profit organisation integrated within the department of Clinical Epidemiology and Public Health at the Hospital de Sant Pau. The CCIb is one of the 14 international centres of the Cochrane Collaboration (CC). Its scope of responsibility stretches across Spain, Portugal, Andorra and all Spanish-speaking countries across Latin America. The CCIb directs and coordinates the Iberoamerican Cochrane Network, provides methodological support to the reviewers of the geographic area of reference and promotes training, dissemination, translation, and identification of clinical trials. The CCIb collaborates actively with many organisations and public institutions since 1997. It is a GRADE centre since 2014 (Barcelona GRADE Centre). 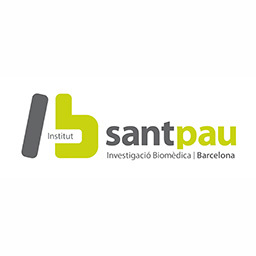 At the same time, it is part of the Sant Pau Biomedical Research Institute (IIB-Sant Pau), legally represented by the Hospital de la Santa Creu i Sant Pau Research Institute (IR-HSCSP). In the COMPAR-EU project, IR-HSCSP is responsible for reviewing evidence and developing evidence for facilitating decision-making processes. OptiMedis AG is a population health management company that is developing regional integrated delivery systems in order to improve health, care experience, and lower costs. 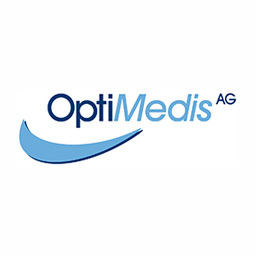 OptiMedis AG manages a group of regional Integrated Care Delivery Systems located in different parts of Germany, and serves as a research and performance management institute to these regional delivery systems. It is well connected in Germany with health insurances, ministries, medical associations and public services. Its model for regional population health improvement has been recognised by many EU best practice awards and received international attention amongst policymakers and managers pursuing the Triple Aim in Accountable Care Organisations. OptiMedis AG is represented in other EU countries by OptiMedis Netherlands bv, OptiMedis Belgium bv and OptiMedis-Cobic UK ltd. 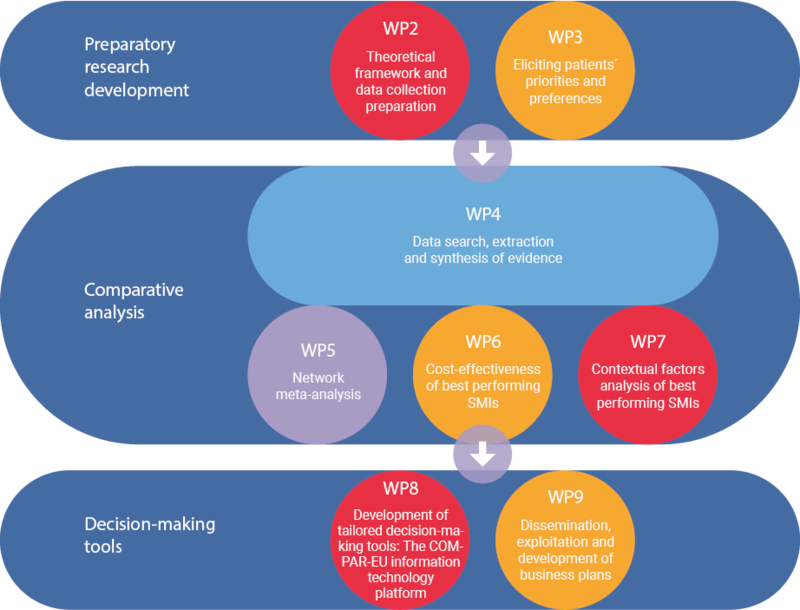 In the COMPAR-EU project, OptiMedis is responsible for implementing a comprehensive dissemination strategy, with a specific focus on patient-centredness of care, and the development of business cases for the exploitation of the research output. 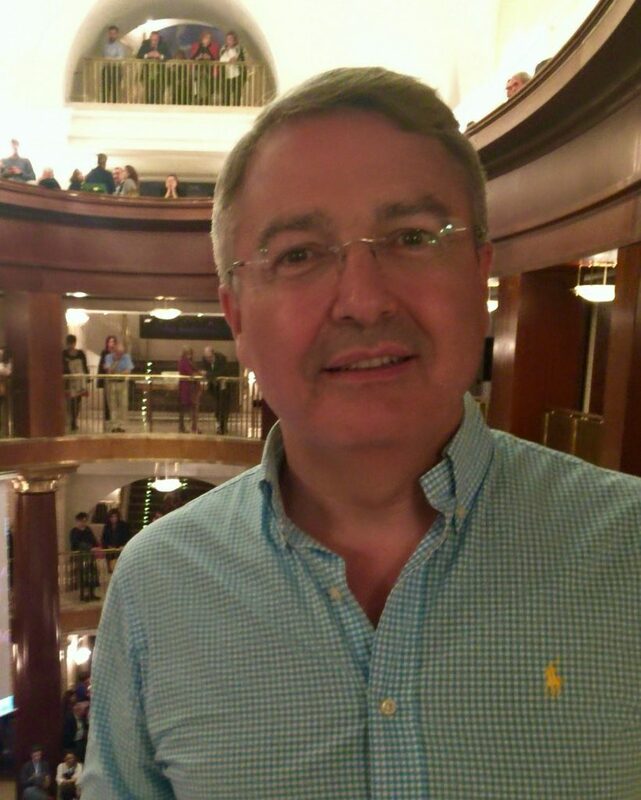 OptiMedis also liaises with the international advisory group and the business development group and acts as Innovation Advisor to the project. The University of Ioannina (UOI), founded in 1964, is a public University and one of the leading Academic Institutions in Greece devoted to research and education. The institution is established in the field of network meta-analysis (NMA). 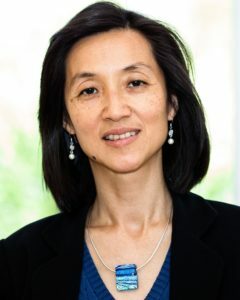 UOI develops statistical methods for tackling methodological problems (missing outcome data, publication bias, developing software for NMA, etc.) and has published a series of NMAs in various fields (mental health, nephrology, diabetology, etc.) in top medical journals. 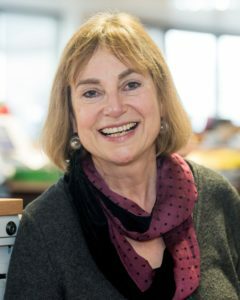 An ERC grant (IMMA 260559), awarded to the institution and more specifically to Professor Georgia Salanti, was very successful in establishing and enriching the NMA toolkit, disseminating NMA and makes it more useful and applicable for clinical practice. In the COMPAR-EU project, UOI is responsible for the development of statistical models in order to rank SMIs organised by condition and outcome measures according to their relative effectiveness. The Advisory Board advises the COMPAR-EU consortium on issues related to project goals and associated legal, ethical, and social issues. The members will play a key role in supporting the dissemination and exploitation of results. The following members represent different stakeholder groups including Patients, Clinicians, Health Technology Assessment, Decision Aids and Patient Empowerment, Health System Innovation, Digital Health Investor, and Industry.